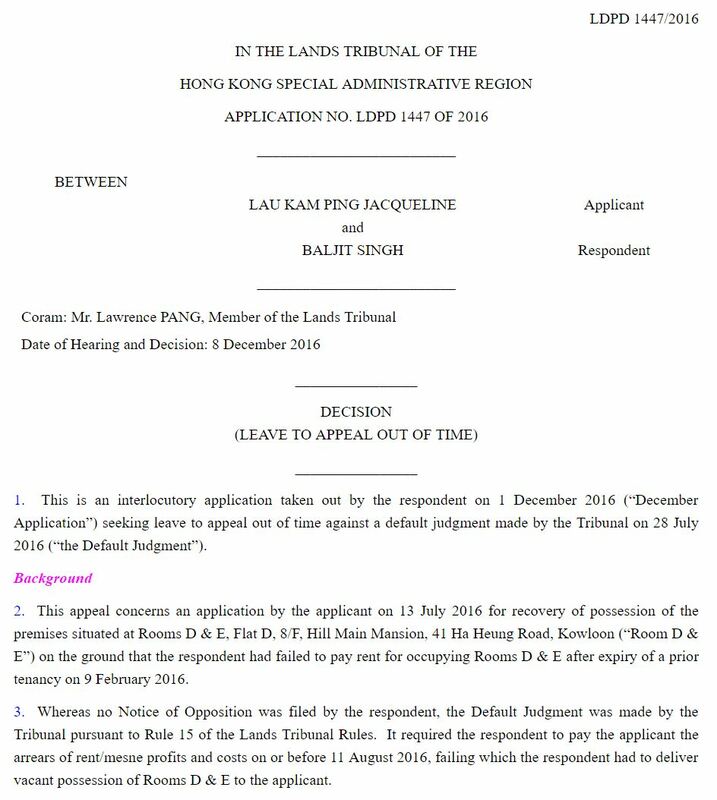 Court would not even stay proceedings with a Legal Aid Department (LAD) memorandum and statutory stay of 14 days. The court found. The asylum seeker had no lawyer and LAD was intervening to assist him. 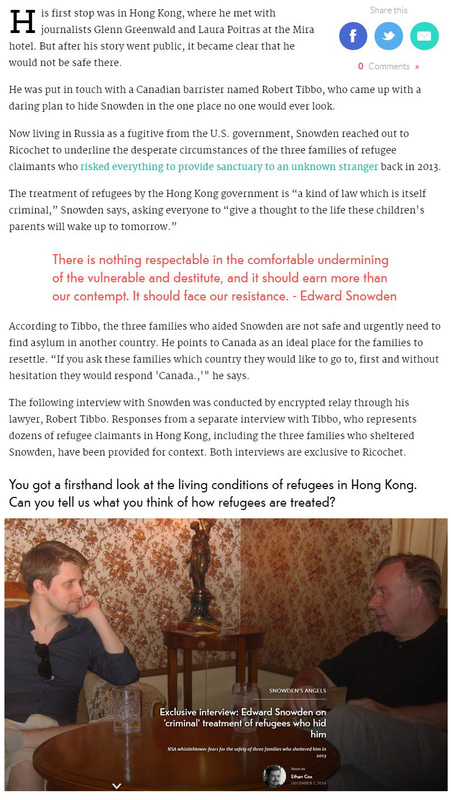 Take note that ISS-HK did not stand up for the refugee and cut off rent assistance to him for one room. Again ISS-HK being on the landlords side. Also the court was on the landlord’s side preventing justice to be seen and to be done on behalf of an indigent refugee and his wife. The court has once again failed refugees. This is another travesty of justice. 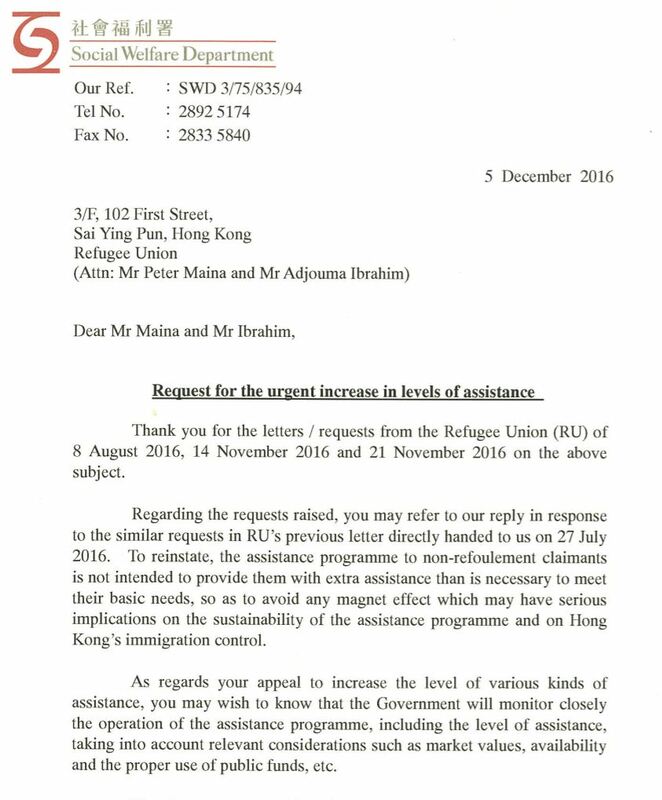 The Refugee Union published the Social Welfare Department reply to a petition requesting the urgent increase in welfare last enhanced in January 2014. Regrettably, the SWD informs that there are no plans to adjust welfare to interim inflation and skyrocketing rents after three years. The SWD alleges that the assistance meets basic needs with 1500$ in monthly rent, 40$ a day for groceries and 200$ transportation, with zero provision for clothes, shoes, shaving cream, household detergents, reading glasses, haircuts, mattresses, blankets, cooking and kitchen ware, furniture, diapers, school supplies and transportation, credit for phones, dental service etc. The SWD also maintains that refugees require a single roll of toilet paper per month. Vision First believe there is little substance in the justification that refugees should be denied anything more than a very basic assistance “so as to avoid a magnet effect.” As there is no evidence of any such “Magnet Effect”, it appears this claim is a wholly speculative allegation. 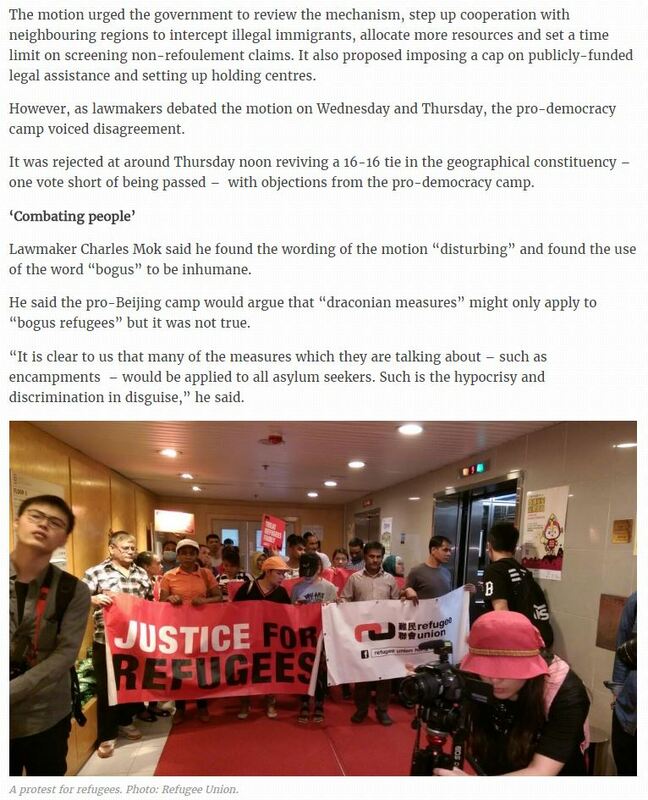 Indeed, the Security Bureau and SWD in their own paper issued to the Legislative Council on 8 June 2015 admitted that they have a duty to meet the basic needs of refugees in full. Thus, the Magnet Effect would only apply to extra assistance, above and beyond meeting basic needs. However, the Refugee Union’s petition reports that welfare fail to meet the basic needs of virtually all refugees. 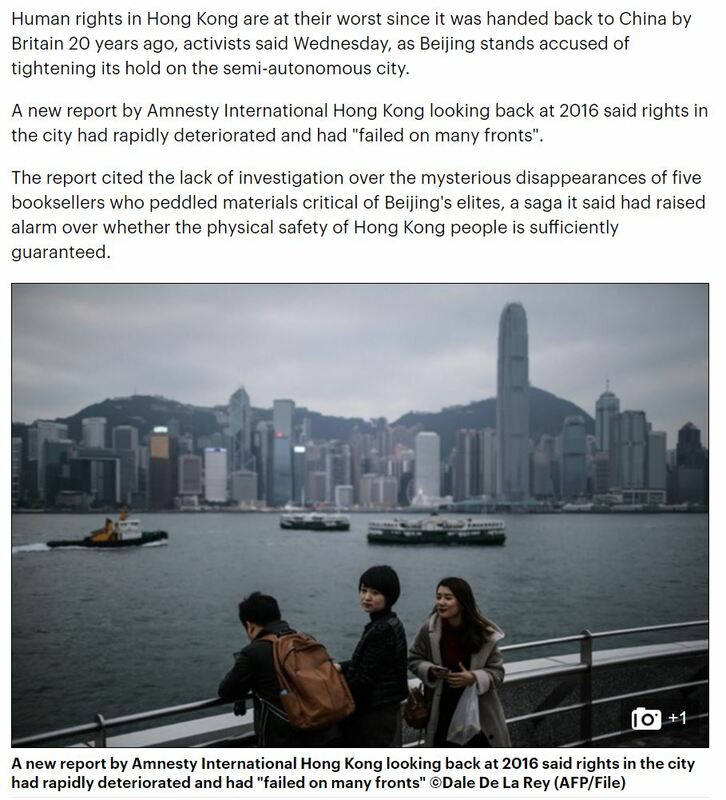 Almost without exception the assistance by SWD and ISS-HK falls short of rental amounts, utilities, food and travel money, besides lacking the above necessities. 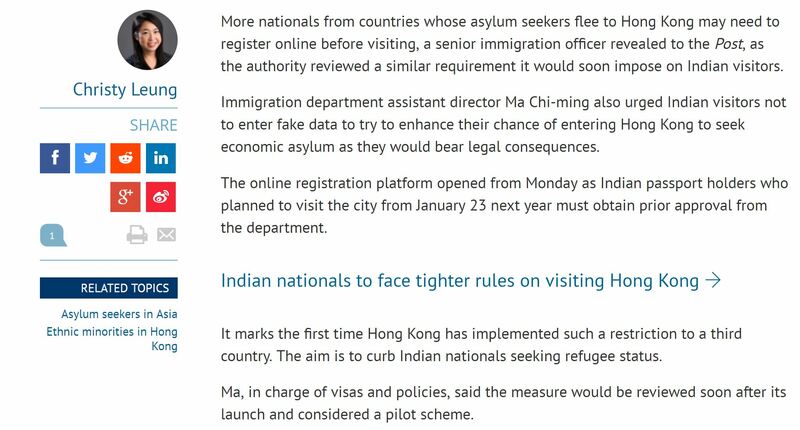 In this regard, the suggestion that refugees in need of more assistance should provide justification to ISS-HK is frankly nonsense, as the assistance requested is to meet basic needs, and not to get something above and beyond the costs of such needs. 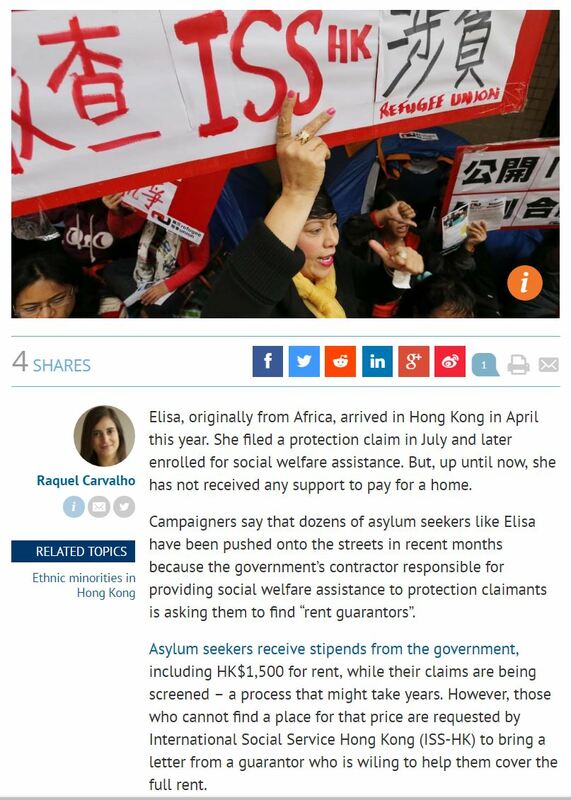 ISS-HK caseworkers treat requests for such basic assistance with typical rejection. Refugees are actually not asking for more assistance above and beyond meeting their basic needs. They are instead asking ISS-HK and the SWD for full assistance in order to meet basic needs – the difference is crucial. There is even greater fallacy in the advice to seek assistance from ISS-HK to locate suitable rooms because the price of subdivided, cubicle and coffin rooms is close to double the rental allowance. Thus 10,000 refugees evidently “have difficulty in so doing” and caseworkers stand powerless before landlords, despite non-binding promissory letters from rent guarantors, local or overseas. Obviously landlords deem such letters non-bankable. Finally, while it is correct that tenancy agreements reflect the terms and conditions agreed between tenants and landlords, it is wholly unreasonable to expect destitute refugees without the right to work to “ensure he fulfills the responsibilities thereunder”. 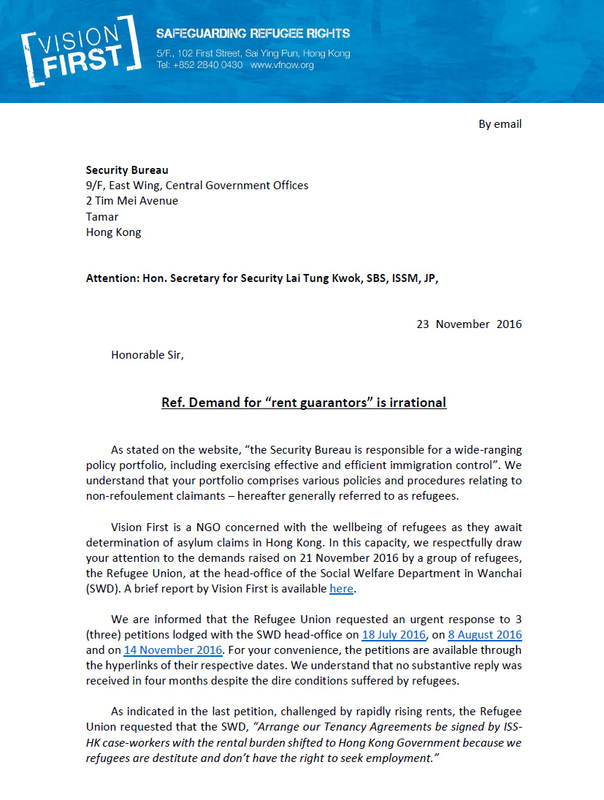 Vision First notes that under Hong Kong law and their own public statements, the Security Bureau and SWD have obligations to meet all basic needs of all refugees in Hong Kong. That is a legitimate expectation the refugee community relies upon. There are no exceptions under the law. It is disturbing that the conduct of these departments’ violates refugees’ rights by putting them at real and immediate risk. The Security Bureau and SWD have failed in their fiduciary duty towards destitute and highly vulnerable refugees. The SWD’s reply to the Refugee Union’s reasonable demands is a false representation to refugees and the public that SWD meets the basic needs of protection claimants. 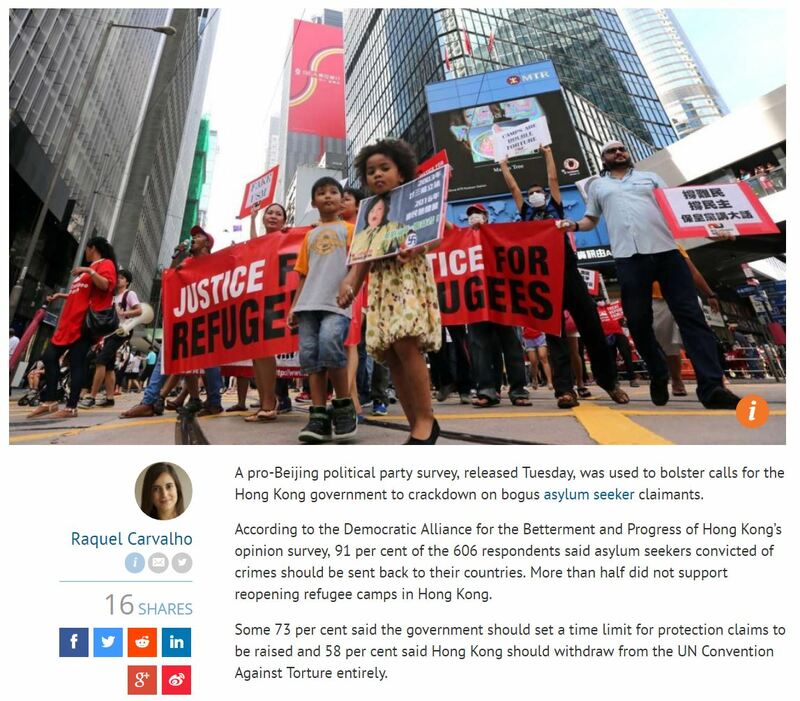 In fact, the SWD arbitrarily violates the fundamental human rights of the vast majority of refugees in Hong Kong. In our view, this conduct is unconscionable and unlawful as the SWD stubbornly refuses to meet refugees’ basic needs and further states that it will not review the current unsatisfactory levels of assistance. 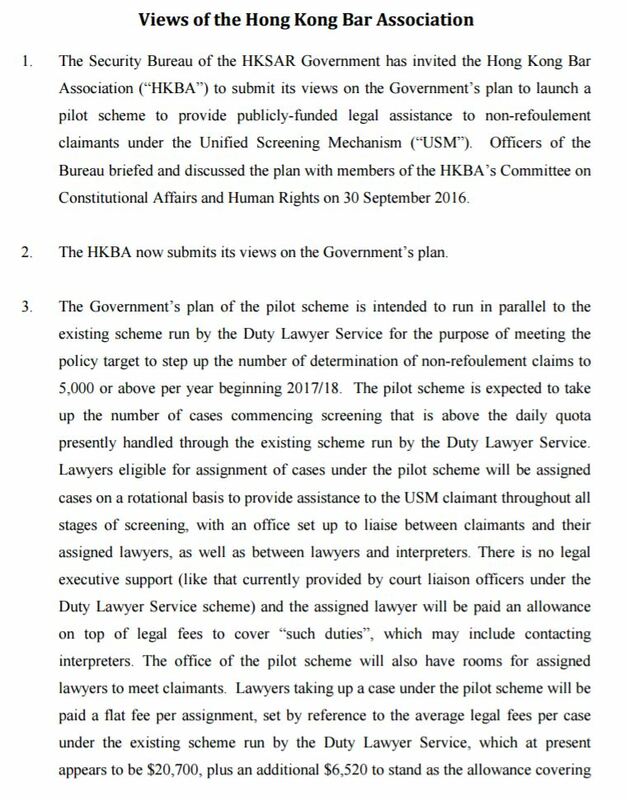 The next step will be a legal challenge.